Search Results for "siberian tiger"
Siberian TIGER eats his kill in the long grass. A TWO shot sequence of an Amur or Siberian tiger, (Panthera tigris altaica) chewing his prey. 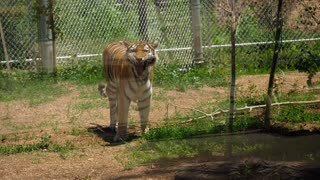 Ussuri tiger eats meat. Siberian tiger (Panthera tigris tigris), also called Amur tiger, is tiger population inhabiting mainly Sikhote Alin mountain region in Primorye Province in Russian Far East. Siberian tiger (Panthera tigris altaica), also called Amur tiger in Russian Far East. It was also called Manchurian, Korean and Ussurian tiger. Close-up of an Amur tiger, also called Siberian tiger, ralaxing in the snow in the winter. Close-up of an adorable baby Siberian Tiger cub drinking from a bottle, being hand-fed. The Siberian Tiger (Panthera Tigris Altaica) is resting. Wild Animals In Captivity. Aerial view of Ocean cliff, steep rocky coastline, Sikhote-Alin Nature Reserve, a biosphere reserve in Russia for the endangered Siberian tiger founded in 1935.